Beaumont Park are hosting a make music day event on Saturday 22nd June when full facilities are available from 12 – 5pm. 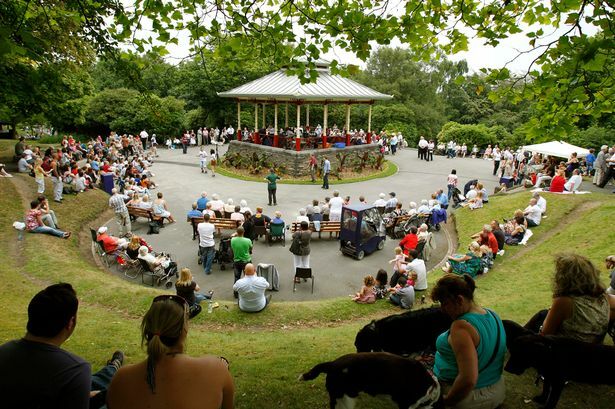 Soloists, instrumentalists, choirs, bands and groups (all ages and abilities) are invited to perform on the iconic Beaumont Park bandstand in a relaxed family friendly environment. Details of performers and schedules will be updated here and is subject to extension if more musicians wish to perform. Your Space Music Lessons is a live online music tuition service. Add your email address below to be entered into the draw to win 10 x 30 minute lessons on an instrument of your choice (subject to availability), a music stand + 2 tutorial books. Enter before 22nd April 2019 to qualify and the winner will be notified on 23rd April 2019. 2 x tutorial books recommended by your teacher. 2. The competition deadline is midnight on 22nd April 2019. 3. The prize is 10 x 30 minute online music lessons with a professional music teacher from Your Space Music Lessons to be booked and taken before 31/12/2019, 1 x music stand and 2 tutorial books (which will be sourced following notification of the winners instrument of level of playing). 4. The recipient must have access to a computer / laptop or tablet in order to receive online lessons via Skype or Zoom. To receive high quality lessons the recipient should have at least 2Mbps upload and download Internet speed. (test at www.speedtest.net). The winner will be required to download meeting software Skype or Zoom on to their device to take lessons. 5. There is no alternative prize or cash alternative. 6. One winner will be randomly selected and notified by email on 23rd April 2019. Drumming lessons has been one of the last core instruments we have added to our instrument profile due to the complex nature of being able to to teach this instrument online. However this is all about to change! Since leaving the UK in 2015 and moving to Utah, Chris Livingstone has been itching to get back in front of drumming students in the UK and has set up a fantastic multi camera kit to teach students and deliver fun and interesting lessons via Zoom or Skype. Chris is now up and running and ready to take new students as part of the Your Space Music Lessons network and free taster lessons are now available. We are delighted to be able to partner with a passionate music educator who can offer the high standard of online music tuition we have set for Your Space Music Lessons. Chris is able to teach the Rockschool syllabus to the highest level and / or teach individual pieces of music and programmes with varying styles. 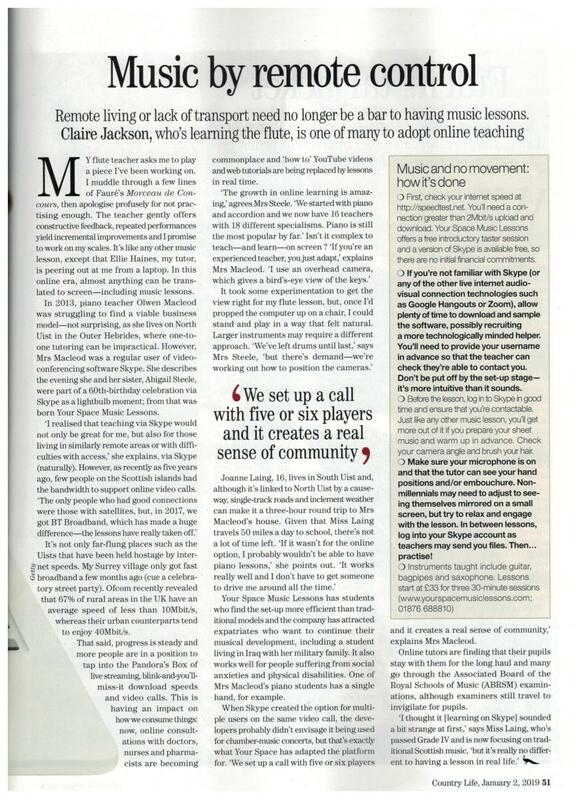 We're in Country Life Magazine! We had a great time being interviewed by Claire Jackson for Country Life Magazine in the 2nd January 2018 edition. Claire even experienced a flute lesson with online flute teacher Ellie Haines to get a full understanding of how easy it is to connect with a teacher online. Trust is a big factor when considering a music school and we know that a recommendation is often helpful for people looking for lessons. If you enjoy your lessons we hope you will tell others of your positive experience. Our new Trust Reward campaign is a £15 cashback reward to any pupil who recommends Your Space Music Lessons AND a £15 cashback payment to your friend or family member when they book their 1st regular priced lesson following a set of introductory lessons. The Trust Reward is valid for new recommended pupil registrations in 2019. Please make sure a new pupil mentions you during the registration process, which starts with a free taster lesson. The reward payment will be paid directly into a nominated Paypal account. Snap Your Musical Instrument in the Best Christmas Photo Ever! We want to build a picture of musicians across the globe celebrating Christmas in their own way, so this year we are looking for the best Christmas Photo featuring a musical instrument. 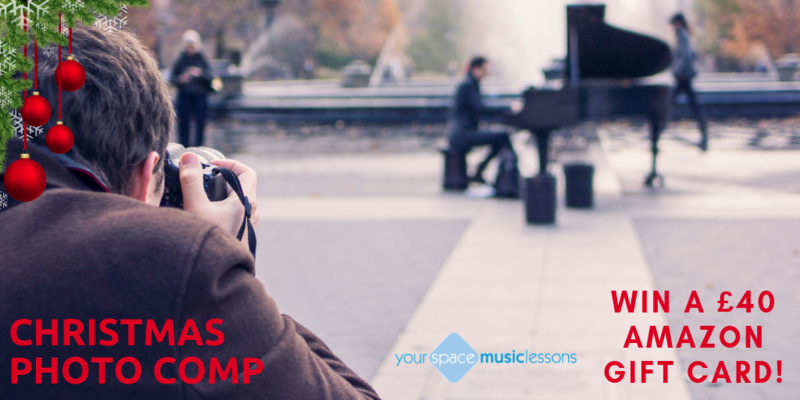 Don't forget to add #yourspacemusiclessons and #yourspacephotocomp with your entry to qualify & follow us to make sure you don't miss the winning photo. Entries close midnight 8th December 2018. The winner of the best photo as judged by the Your Space Music Lessons team will be notified by 10th December 2018. By entering the competition you give permission for Your Space Music Lessons to feature your photo on our website, on our social media channels and emails. A £40 Amazon Gift Card will be sent to the winner as an e-gift via email. The judges decision is final and there is no alternative prize. The free lessons are available for certain online purchases and in their London store up to 24th December 2018. Vouchers must be redeemed before Sunday 13th January and all lessons must be redeemed and have taken place by Sunday 31st March 2019. 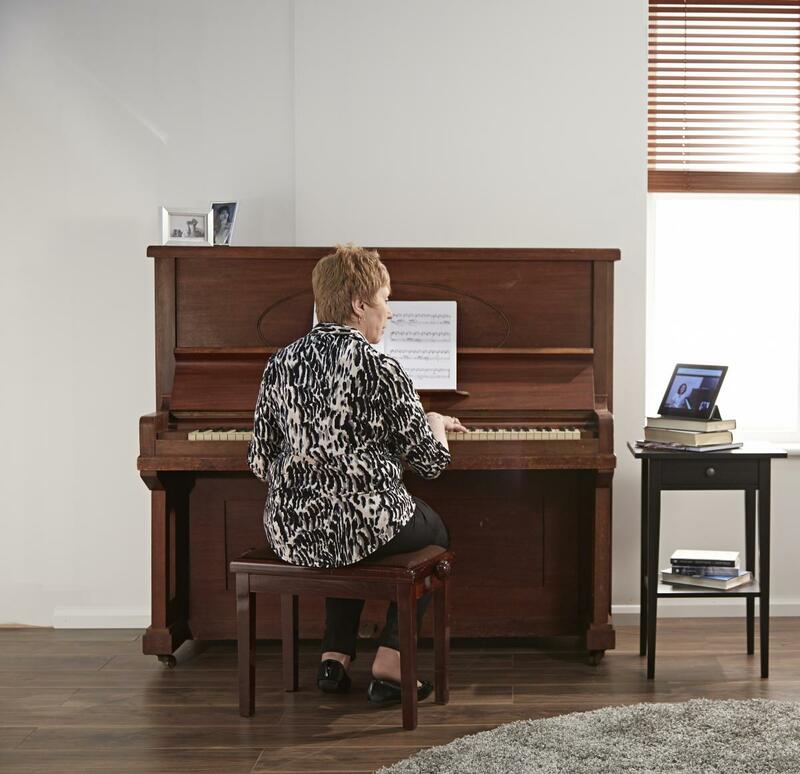 Personal online music lessons are the perfect add-on to give customers an introduction to their instrument, in their own home. So proud to be recognised as delivering high standards in online music tuition, and proud to be working with great brands such as Yamaha. 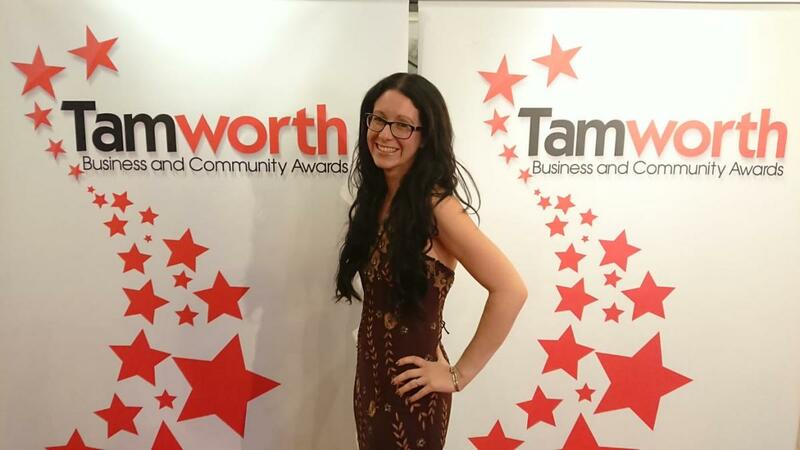 Your Space Music Lessons online saxophone teacher, Alison McAusland @McAuslandMusic celebrated her nomination for a Tamworth Business and Community Award on Friday. Alison is so passionate about making music accessible to all and we are so proud to be working with her with the same vision. Online Music School, Your Space Music Lessons has launched a new drive to make music tuition easier for families to access. In a new partnership with ‘rent to buy’ instrument service Duet Shop, new orchestral instruments can be obtained from just £7.50 per month. For families who find it hard to budget for instruments and have little time to access quality tuition, it is hoped this partnership will enable more children and adults to learn from a broad range of orchestral instruments in their own home. Your Space Music Lessons, launched in 2013, is one of the leading online music schools in Europe delivering personal tuition with ‘conservatoire’ level tutors, in a model that reflects the need for a ‘face to face’ learning experience in a digital age. 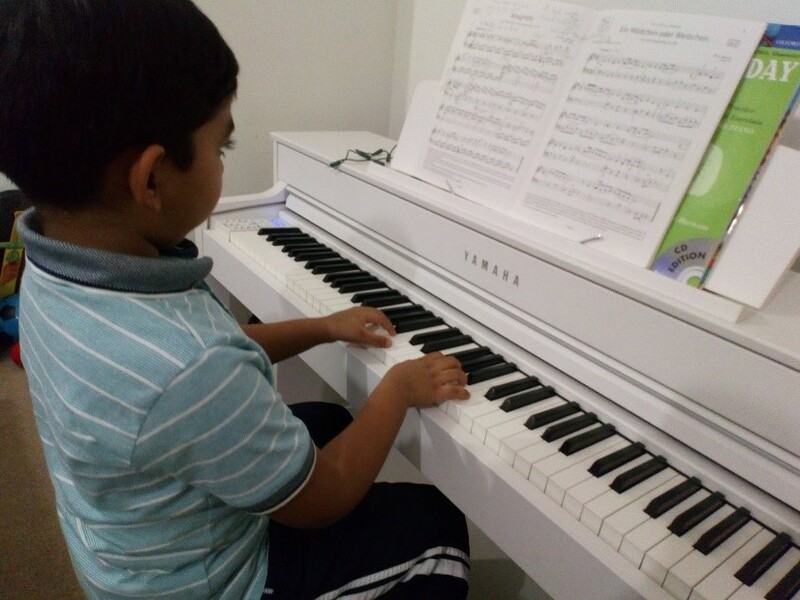 Your Space Music Lessons has helped many people, including Haseeb (pictured) access tuition wherever they may be located. This was the best solution for us based in London, where we didn’t need to travel yet we get a professional music teacher during the daytime’ tells Haseeb’s mum, Nazia. 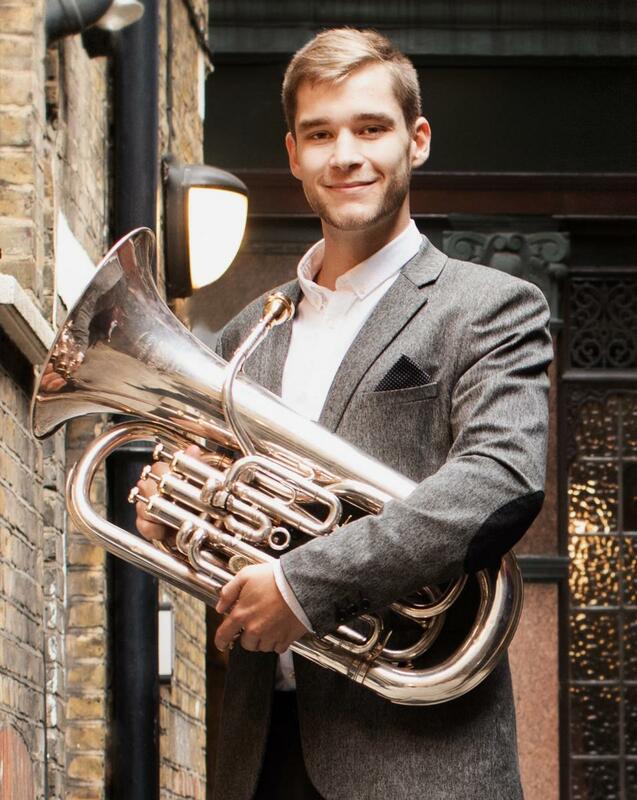 The partnership will also tackle another rising problem of endangered orchestral sections, as Duet Shop instruments are delivered to homes and Your Space Music Lessons operate entirely online, so that it is easy to access and learn endangered instruments such as the viola, oboe and cello. “We are delighted to have the opportunity to work alongside Your Space Music Lessons in support of their excellent Online Tuition Service. Our shared core vision is that everyone should have access to a new, quality musical instrument which in turn would enhance their engagement with musical education and tuition. Budget should never be a barrier to aspiring musicians, access to a new instrument is available from as little as £7.50 allowing Your Space Music students to concentrate on making music without worrying about the cost”.